[Ed: We're happy to bring you Yevgeniy Shukhman's interview with Marka27, creator of the upcoming Minigods figures]. Hello Marka please introduce yourself and give us a little history about your nickname. I'm known as "Marka27". 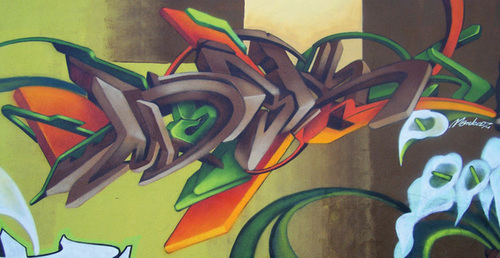 Marka is the graff name i chose to write. It's Spanish for leaving a mark on a surface or brand. It also represents my Mexican roots. The 27 has a secret meaning only close friends know. 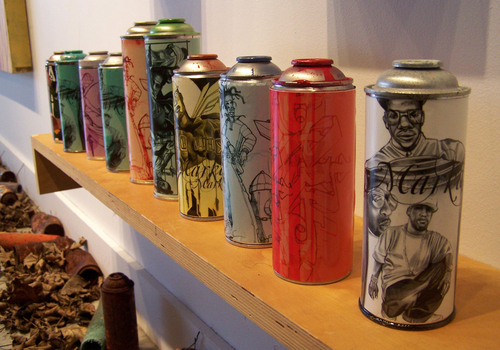 You are first and foremost a graffiti artist. How did you transition to graphic design? That's an easy question, why does anyone do graphics design, "To Eat". On another note it can also work as a form of art or tool for me to get my message across. It wasn't a big deal making the transition graphic design and graffiti have a lot in common when it comes to color, balance, composition. Do you still do graffiti? Does J Dilla make dope beats? Please tell us a little more about your fine art? Lately I've been working on a series of paintings called "Audio Canvases" They are paintings that play music. 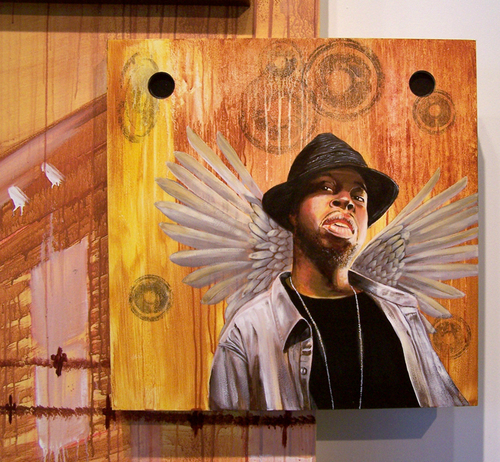 I have a J Dilla painting that plays his instrumentals. They are made from a wood surface with real working speakers installed. 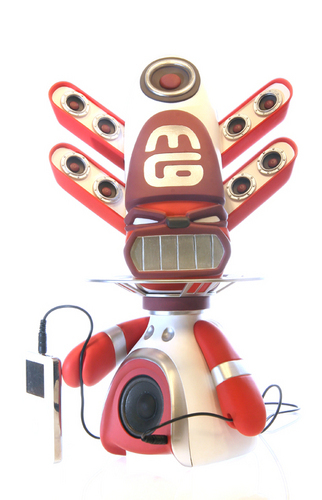 I have also been working on installations with vintage speakers stacked on top of each other with musical icons painted on them like Afrika Bambbata, Billy Holiday, Celia Cruz etc. I won't name names but recently another artist attempted to steal my concept. I know in the art world people freely so call "borrow" from each other but in the graff world you get no respect for "biting" a style or idea. The streets, Ancient Indigenous cultures, Fellow Artisans, Boom Boxes, Bodegas, Old School Transformers. God, Family, Life in general. What is your approach to designing for kids? For instance you've done packaging and designs for "Bratz" and "Chicken Little". How do you make them cool? I make them super fresh then some corporate guy in marketing says it's too cool, so then after 20 revisions you get a watered down version. Ask any designer they will agree. If I want to make something real and pure I need to separate it from the mass market. You're a big fan of vinyl toys. Are you a collector yourself? Yes, I collect a few things. Trying to work on collecting $$$$$$ -- so i can support my bad habits and addiction to vinyl,boomboxes ,Transformers,and a few other things. Tell us more about your new Minigods vinyl figures. Minigods are the "givers. of. divine. sound" Two years in the making. I wanted to create something with some substance. 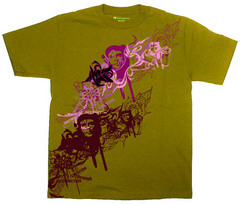 The inspiration comes from ancient cultures like the Aztecs, Mayans, or more recently the Massai. I wanted to do something fresh that hasn't been done a million times in the vinyl world. They are meant for people to set themselves apart from the everyday, a form of expression through visuals and sound. I think it's more personal. Anybody can spend a lot of money on a vinyl toy and another person will have that same toy you just bought, but the chances that you will be playing the same music on the same toy are not as likely. The use of working speakers is a prominent design feature in your vinyl toys -- including the Minigods and your customs. Would you call it your signature style? I don't want to limit myself to that. 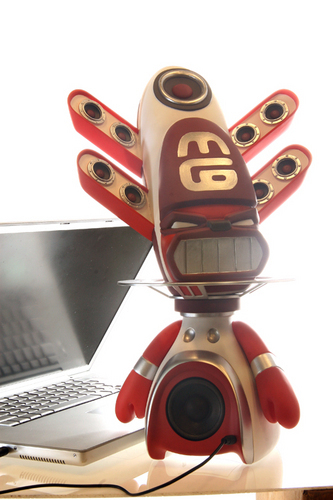 Jason Siu, a Hong Kong artist was the first to combine a speaker to designer vinyl. I wanted to take an approach where the design still holds its own even without the presence of the speaker. Vinyl figures usually don't have any practical use, but on the other hand the Minigod has a working speaker, which in my experience has good volume and sound quality. Are you happy with how it sounds and the final outcome? I'm excited about the outcome but even more excited for what the future holds. There is always room for improvement. The first minigod was a great start and the sound is better than most desktop speakers. They are user friendly and can be used as portable speakers also. How did the SURU Exclusive Minigod happen ? A good mutual friend introduced me to SURU. I was told they only sell original and unique items in their boutique. They were into the Minigods and excited to have a SURU exclusive. I'm honored to be working with them. When will the SURU Minigod be released? The release is August 31st, they will only have a few on hand so it's best you get there early. It will be from 7pm till 11pm, open bar, DJ's and live painting, what else could you ask for. It's going to be a dope show! If you can't make it but still want a shot to purchase a minigod you can order one directly from SURU. Congrats on a great figure!! So it's okay to "borrow" Jason Siu's design concept? But not for another to "borrow" your speaker/art concept? Not hating, just struck me as rather contradictory. I can't wait to check out the SURU exclusive. I had the pleasure of hearing the "Mini god" and the sound fantastic ! BIG UPS TO MY BOY MARKA 27. 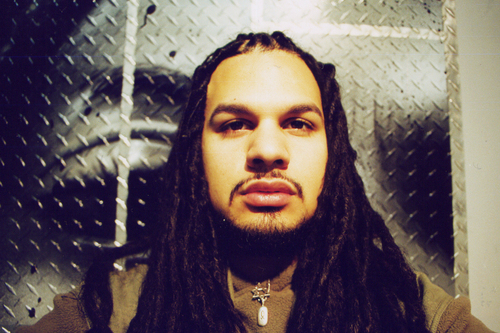 HE IS ONE OF THE MAIN REASONS WHY I STILL DO GRAFFITI TO THIS DAY. HE HAS DEFINETELY HELPED CREATE A SPRINGBOARD FOR ARTIST LIKE MYSELF TO PUSH MY ART AND STILL BE ABLE TO FEED MY FAMILY. MUCH RESPECT TO MY MAN MARKA 27. PEACE AND GODBLESS...... ARMA SOUR GRAPES CREW. it also looks like you're "borrowing" joker's graff style pretty heavily. MARKA IS DOING THE DAMN THANG!! A TRUE INSPIRATION TO A LOT OF YOUNG UPCOMING ARTIST OUT THERE! KEEP IT FRESH MARKA! Thanks for the suport and I hope I see you guys at SURU August31st.